I can’t remember the first time I met ‘Crazy’ Philadelphia Eddie Funk. It was probably sometime in the early 1990s, and you can bet that he had on some godawful suit (who knew that meringue was an option for suits?) with a trademark screwdriver in each hand. But every time I’d see him at a convention over the years, he’d always make me laugh and, despite how old I get I doubt he’ll ever stop calling me ‘kid’. Eddie, along with ghostwriter/PhD Dr. Eric Foemmel, has been chronicling his life and times in book form with the series “Tattooing: The Life and Times of Crazy Philadelphia Eddie”. They run like a standard oral history with Eddie narrating his life (and I believe come in audio form as well, read by the author) and are extensively illustrated with amazing photographs from the last hundred plus years of tattoo history. I picked up volume one from Eddie this weekend at the Philadelphia Tattoo Arts Convention; I’ve skimmed through it with plans to pick up the other available volumes soon. 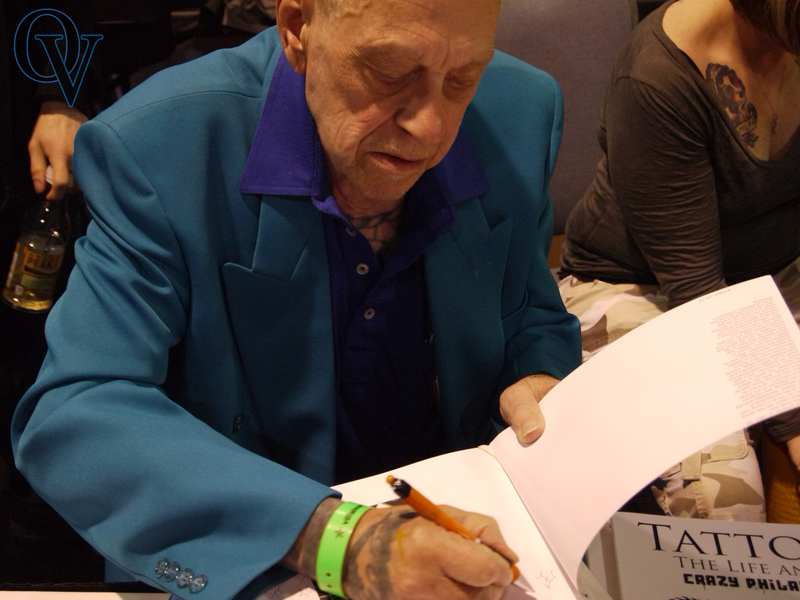 Here’s a snapshot of Eddie signing my copy of Vol. 1. Godawful suit, screwdrivers on the table and a ‘here ya go, kid’ when he handed it over. Seems about right…. You can find our more about the book series here: Crazy Philadelphia Eddie.